Tonight on CBS their drama Bull inspired by Dr. Phil McGraw airs with an all-new Monday, October 22, 2018, episode and we have your Bull recap below. 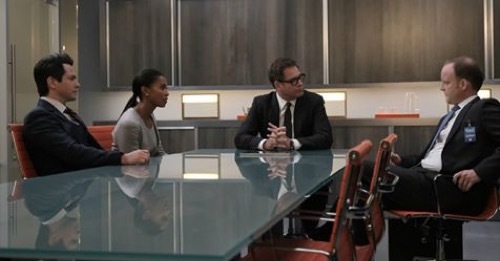 On tonight’s Bull season 3 episode 5 as per the CBS synopsis, “Bull joins the defense team of a seemingly unwinnable case when a doctor is put on trial for murder after his submission to a DNA database links him to a homicide. A pediatrician was hiring Bull because somehow his DNA had been found at the scene of the crime on tonight’s all new episode of “Bull”. The crime itself was murder. Joseph Lowell was a heroin dealer and he had been killed execution style at his apartment in the projects. The man accused of killing him was Dr. Michael Harper. Harper has no arrest record, has never been to that particular hosing development, and claimed he never met the victim. The only thing connecting Harper to the crime was the DNA. Lowell had struggled with his killer and had his DNA under his fingernails, but the cops had run that DNA against their own database and had found nothing. They only made the connection with Harper because of one of those genealogy tests. Harper was an only child with two daughters and both of his parents were dead. He thought he was the last of his family and so his wife sent in his DNA to see if there was a way to connect her husband with his roots. No one knew that this harmless mouth swab would be used in a murder case and yet that’s what was happening. The police had a search warrant and they got the DNA legally from the company. Only the company was first tricked. They had been sent DNA under an alias name to the company and when that same company had replied that the already had the sample. Their decision to flag the sample let the police knew which company to get a search warrant for and so it was legal if not ethical. Bull’s team had tried to get the DNA thrown out for that and it hadn’t worked with the judge. Judge Volk said that Lowell was a father and that he had been the only person that his son had. The poor boy was put into the system following his father’s murder and that’s where he’ll probably stay until he’s eighteen. The judge thought this boy deserved justice most of all. Hence she allowed the Assisted District Attorney to continue with the DNA and unfortunately that wasn’t the only thing that the ADA had. Bull had seen how confident the other man was and he basically demanded the truth from Harper. Harper was holding onto something because he didn’t think it was important and that meant it was. Bull demanded the truth and so Harper told him about his former addiction to prescription pills. He had gotten injured a few years ago and was prescribed oxy. Harper became addicted to them and his wife was forced to give him an ultimatum. She threatened a divorce and said she would take the kids if he hadn’t gone to rehab. He went for treatment and he’s claimed he’s been clean ever since. And so he had been hoping that his past history wouldn’t be used against him. Unfortunately, Dr. Harper had been wrong. The ADA hadn’t called his wife to the stand because of spousal privilege and so he chose to call Harper’s neighbor instead. The neighbor had a doctor as well and he had been the one that supplied Harper with a prescription for oxy. The ADA got the neighbor to admit to that on the stand and he also had one more to call to the stand. He called Sam Lowell. The boy had been in his room when his father was murdered and he had apparently looked out when he heard the struggle. He said that he saw Harper and he testified to that in front of the judge as well as the jury. All of whom were willing to believe him over the man accused of murdering his father. And so it didn’t matter that Harper was still claiming he was innocent because the case was sunk. Bull’s team had tried to prove that Harper’s DNA got on Lowell some other way and it turns out the only place they could have met – they didn’t even see each other. There was nothing anyone could think of that would prove Harper’s innocence when there was so much evidence against him. He still said he didn’t do it and he hadn’t wanted to take the deal that Bull had worked out for him. The deal would mean he’d spend fifteen years in jail and he didn’t want to miss out on his own children growing up. Dr. Harper decided to go home and think about the offer, but something he said about growing up and feeling disconnected had registered with Marissa. She felt the same because she had been adopted and so she had their new techie to check out the theory. It turns out the doctor had been adopted. His parents just didn’t tell him. His adopted mother was unable to have kids and neither she nor her husband had told Harper because as far as they were concerned he was their son. They even changed his name. His name was Jackson McKay and he had a twin named Brandon. Brandon was a homeless heroin addict that was a known associate of Lowell and a witness at his shelter said that Brandon was looking for another fix though didn’t have the money. Him killing Lowell would make sense! He got the drugs and the money. He also knew where to get those things from and so the ADA quickly dropped the charges when he heard about Brandon McKay. Only Brandon couldn’t be charged because he had overdosed before the trial and so Dr. Harper regrets losing his last chance at having his brother. The doctor didn’t even care that Brandon had did horrible things for little reason. He still would have liked to have met someone with his face. The doctor was also curious about what would happened to Sam Lowell and it turns out Sam had some cousins that were happy to take him in. And so at least the little boy didn’t have to stay in the system.